A Bridj vehicle can carry shipments as well as passengers. If Matthew George has his way, a robot might deliver your groceries, maybe as soon as this year. George, 26, is cofounder and chief executive of Bridj, a Boston transportation startup that runs an Uber-like bus service in Boston, Washington, D.C., and Kansas City. Now George is planning to launch BridjBOX, a delivery service that would use self-driving droids to bring packages to your door. “Through BridjBOX, we’ll be able to seamlessly and autonomously deliver goods alongside people, thus allowing one vehicle to do the job of five,” George said. An example of a delivery robot, from Starship. That’s the plan, anyway. George said Bridj is testing a number of delivery robots, but declined to show them or describe them in detail, citing nondisclosure agreements with the robot manufacturers. Bridj already has thousands of riders in Greater Boston who use a smartphone app to summon a ride from its buses. Unlike standard city buses, Bridj buses don’t travel preset routes. Instead, the company’s software makes up routes on the fly, based on where customers are requesting rides. A typical ride costs about $4.25. With BridjBOX, the same 14-seat buses would be stuffed with parcels as well as people, and the same routing software would design optimal delivery routes. The drivers would offload the packages to storage lockers around Boston. At first, human couriers would walk the packages to their destinations. But George hopes to be using robots before the year is out. The machines would be able to open the lockers, extract the packages, then roll down sidewalks at about 3 miles an hour to deliver them to a home or business. The robots won’t climb stairs or ring doorbells. They would just drop the package at the door and roll away. For now, Bridj is practicing by delivering only merchandise that is for sale on its website, Bridjbox.com. The site offers beverages, such as seltzer and bottled water, and dry goods, including paper towels, trash bags, soap, and detergent. It hopes to expand into deliveries of perishables such as fresh produce and wants to strike delivery deals with other retailers. And there’s more to come. George said he’s working on a long-term plan to automate Bridj’s buses so they could navigate city streets without a human at the wheel. “We’re going to start to introduce autonomous vehicles and autonomous delivery devices over the coming months, using Boston as a laboratory,” he said. 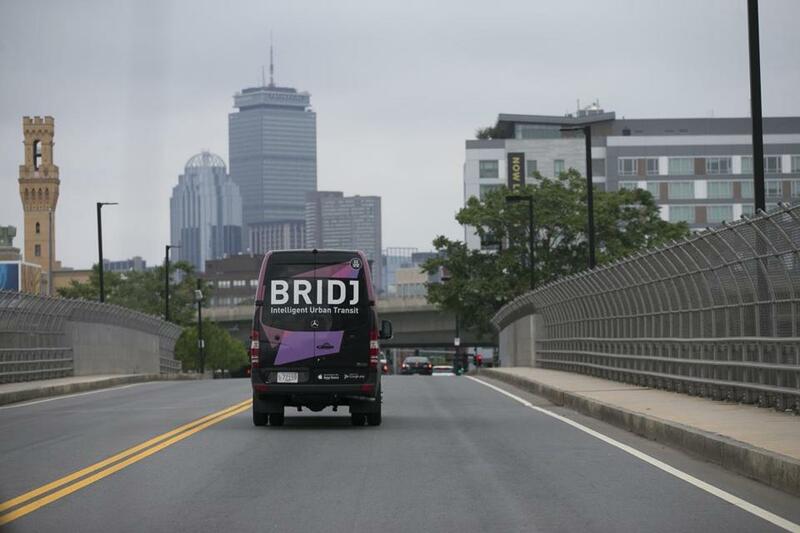 Bridj intends to clear the robotic delivery service with Boston city officials before proceeding. But a spokeswoman for Mayor Martin J. Walsh said that the city has not yet discussed the idea with the company. Other cities may beat Boston to it. 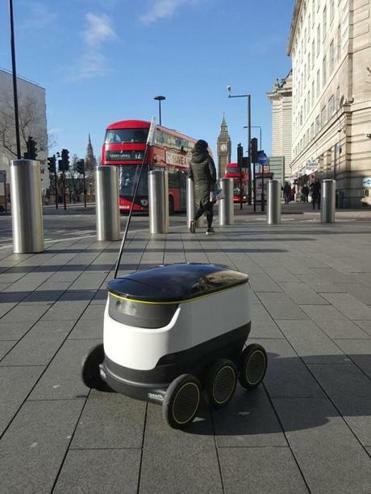 An Estonian company, Starship Technologies, said in July that it would use robots to deliver takeout food in London, through Just Eat, a British food delivery service. Starship is also supposed to start delivering mail in three cities in Switzerland next month. The robot is a six-wheeled vehicle that looks a lot like a rolling beer cooler. Starship said it has tested the machines in 40 cities, covering more than 5,000 miles without an accident. In Palo Alto, Calif., researchers at Stanford University said they are working on Jackrabbot, an automated delivery cart. Dan Kara, a robotics industry analyst for ABI Research in New York, said that with today’s navigational technologies, the BridjBOX robots should have no trouble finding their way through Boston. But he warned that thieves and vandals may be a tougher challenge. “The questions I have are in terms of security and malicious activity,” he said. George said the same cameras the robots would use to navigate would also serve as a security system. While he’s counting on the public’s good behavior, George realizes there’s a risk in sending defenseless robots through Boston’s streets. 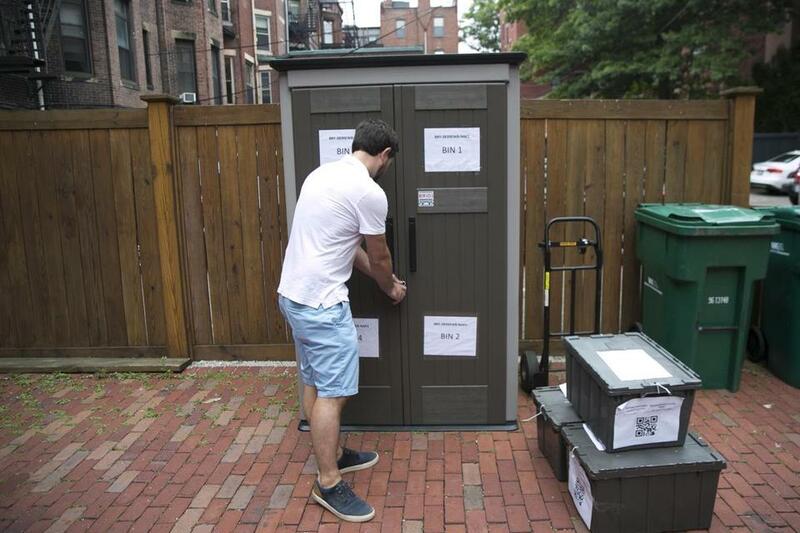 Bridj engineer David Graves used a bloothtooth app to unlock a neighborhood distribution locker.